Tihomir Ognjanov (2nd of March 1927 – 2nd of July 2006, Subotica) was former Yugoslav football international, member of legendary Yugoslav Olympic Team, outstanding right-winger, national team member and club coach. Ognjanov started his career in 1939 at ZAK Subotica youths followed by spells at RSK Subotica and Backa before his 1946 move to Spartak. 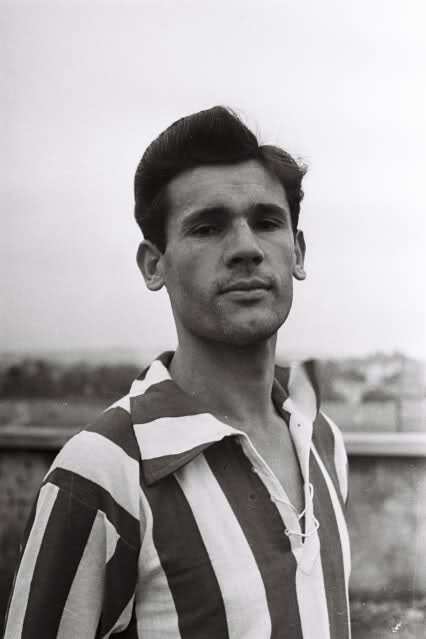 During his 1947 regular Yugoslav army military service, Ognjanov also made 9 appearances for Partizan, scoring 7 goals for the club from Belgrade. He reached his career`s peak playing for Crvena Zvezda (25th of August, 1949 – 24th of May 1953), making a total of 181 appearances and scoring 73 goals (75 league appearances and 22 goals scored), winning two Yugoslav Championship titles (1951, 1953) and two Yugoslav National Cups (1949, 1950). Ognjanov signed back to Spartak in 1953 and played for the club until he hanged his boots playing his final career game on 5th of March 1961. In total, Ognjanov made 110 league appearances and scored 71 goals for Spartak. He also made 5 appearances and scored 3 goals for Yugoslav youths in 1953, played for Yugoslav B national team between (2 apps, 1 goal scored) and Yugoslav senior national team (28 apps, 7 goals), Ognjanov made his senior national team debut in a 5-1 win in Belgrade over Denmark on 28th of May 1950 and made his final national team appearance on 17th of June 1956 in Zagreb, in a one-all draw against Austria. He participated in 1952 Finland Olympic tournament and won silver medal as part of Yugoslav team defeated 2-0 in a tournament`s final in the hands of Hungary. At 1950 Brazil World Cup, Ognjanov suffered an injury during Switzerland 3-0 win but played until the very end of the match, even managing to score a goal. He was called-up for Switzerland World Cup 1954 but didn`t play as he never fully recovered from previously sustained groin injury. Due to numerous injuries, Ognjanov was the only member of famous Yugoslav Olympic Team who didn`t celebrate Golden Jubilee – 50 national appearances. Upon hanging his boots, Ognjanov was coaching in OFK Subotica, Spartak, Crvenka (two spells) and Sever Subotica. He was part of FK Spartak technical management and club`s assembly member. Ognjanov retired as Suboticanka company traveling salesman on 21st of July 1983.